Unfortunately KCW Days 6 & 7 were a bit of a bust... I did get another shirt for the little Miss cut out on day 6, but otherwise unless you count my hour per day spent "researching" aka, fabric shopping & pinterest searching for inspiration, I didn't get much done. This was, however, the first KCW I planned for, put fabric together from my stash, chose patterns and cut out patterns and fabric beforehand. I had 10 items planned, 4 for the boy and 6 for the girl. 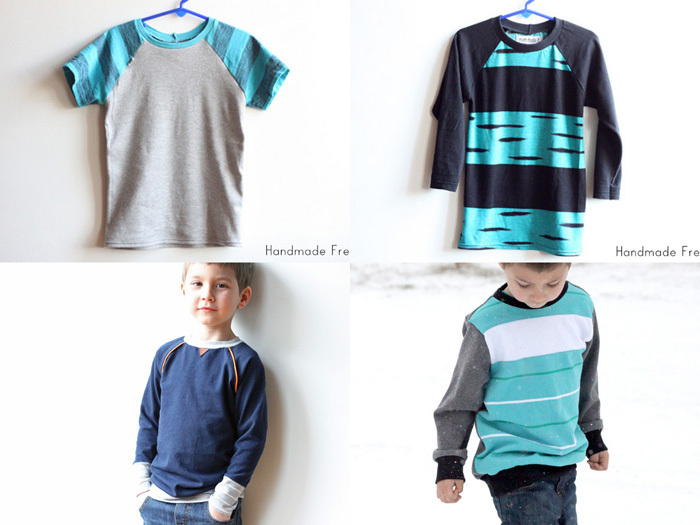 I got all 4 of them completed and blogged for the boy. 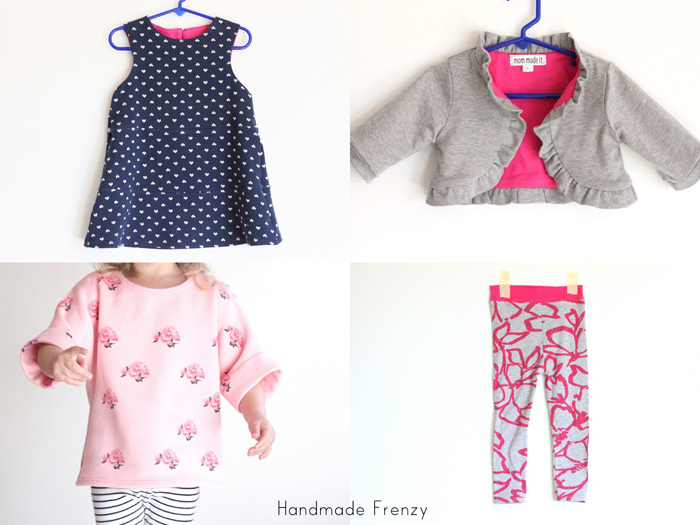 3 items I had planned and one I added last minute, completed and blogged for the girl. 8 items done in 5 days. I am calling it a smashing success! I am already looking forward to the next season of KCW and hoping my schedule looks as clear for that one as it was for this season. So. Much. Fun! 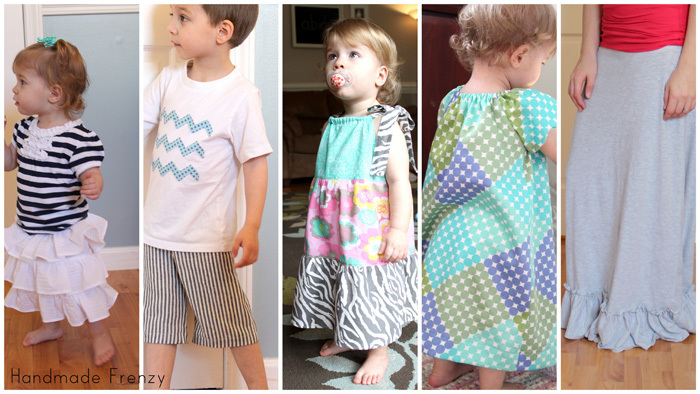 January also marks a year since I started sewing clothes for my kiddos. I had made maybe one or two garments for them before January of 2013 and a skirt or two for myself. May 2012 - Cutest baby in the world? Yes. Yes, I do think so. *Tears* I miss that baby stage!! January 2013 I decided to make a self-proclaimed "sewing month". I made 5 wearable garments that month. And some carseat covers, baby blankets, etc. But, wow, that little bit of sewing turned into a whole lot more than I ever imagined! I caught the bug for sure. 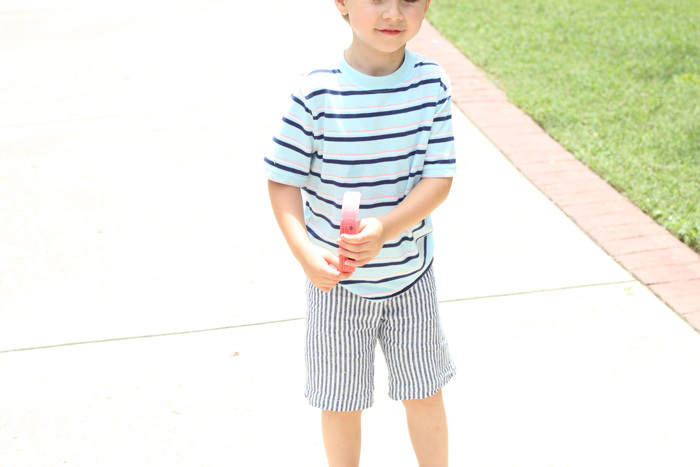 I still remember sewing the very first pair of shorts for Evan. Using the MADE tutorial & pattern. 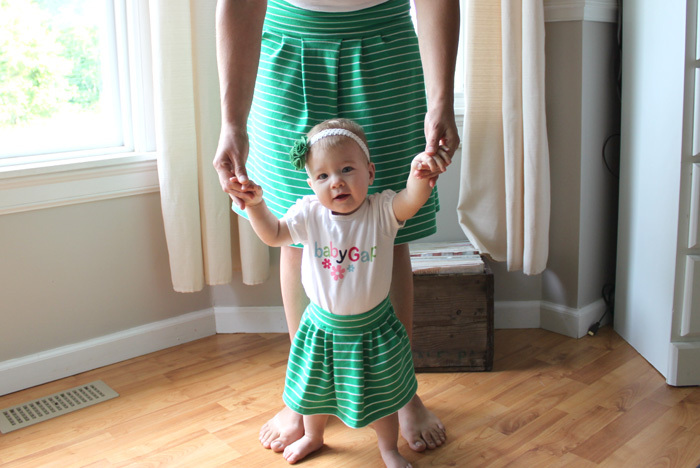 This was after sewing the peasant and pillowcase dress pictured above for Olivia. Something about sewing PANTS felt so much more accomplished. That just fueled the fire and made me want to sew, ALL. THE. THINGS! It has been a huge adventure, I learned so much in the last year, not just about sewing, but about myself and an awful lot about myself as a mom, about family life and our dynamic in our home. Starting this little ol' blog was the biggest push for me, sewing related. That is all thanks to my WONDERFUL friend Amber for giving me a huge push and the confidence I needed to just DO it, already! I'm still trying to find my "niche", but I feel like I'm getting there. I've met some wonderful people, and learned so many things from them. Thank you, all! It's true what they say, the online sewing community is a wonderful thing to be a part of. Thanks for humoring me in my little bit of reflection. I can't wait to see how much I'll learn in the next year. Not just sewing related, but about life and as my kids grow. Becoming a mom has always been my biggest dream, and now getting to be just that is the most rewarding and also the most challenging thing I've ever done. I wouldn't have it ANY other way. Good thing you started blogging, because I find a lot of the looks you churn out inspiring! and I felt the same way the first time I made shorts - a lot more rewarding than sewing a skirt. I really love the fabric you used! It is very inspiring to see where we used to be isn't it? Thank you Shantel! It really is, makes me want to keep going :) Congrats on your new little babe as well!! I love everything you made for KCW! You got to sew so much in a week! And thank you for sharing your creations with us through this blog. I have started to blog recently too. Well, to be true I have been secretly blogging since 2007 but only now decided to share my blog... so I feel that I just started real blogging now and it was also because of this wonderful online sewing community. Oh my! This is my first time to you site and I'm impressed. What beautiful work! You make adorable things. Thanks for linking up at The Makers! super amazing job! That is a whole lot of clothes for just one week of sewing! And they all are stylish and comfy too. well done! Thanks so much Meg! I can't wait for more KCW's to get myself in gear. My kids' wardrobes love it :) Thanks so much for putting it all together!